Random Panel: I know one — cancer! 11 Responses to Random Panel: I know one — cancer! Who knew you could hold uranium like a loaf of bread? I’ll have mine toasted with jam, please! And on that day became STERILEMAN! …by the way, is that a Steve Ditko illustration, by chance? Like, early Ditko? 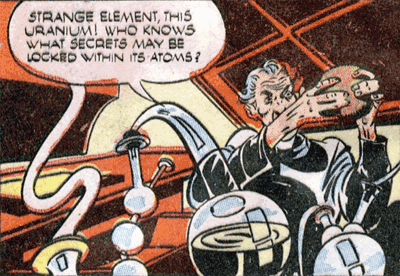 It certainly does have that look, and it’s from 1946’s “Science Comics #1”, so the timing is about right. They don’t give credits, unfortunately, so I don’t really know. It’s just a *really* bad idea! Let us look to ol’ Doc Brown for some insight into that era (…and of course I’m paraphrasing here. ): “I’m sure in 1985, plutonium is available in every corner drugstore.”. Of course in the next aisle over you could pick up “Phineus Roger’s Cancer Cream*”– one dab’ll do it for all those worrisome tumors & growths. And add a dollop to your favorite soda for a minty treat. *Warning: You may experience sudden hairloss and/or nausea, vomiting, and stroke. How much would a chunk that size weigh, anyway? About forty pounds or so? By 1946, we had developed, built and used two atomic bombs. I’m pretty sure the scientist-types were well aware of the consequences of the “loaf of bread” method of handling uranium. Funny Book makers though, not so much…! The comic’s from 1946, but the story actually is about the discovery of radiation. Sadly, a lot of the early pioneers in the field did die of cancer, almost surely from exposure before the dangers were fully understood. The man in the panel is Antoine Henri Becquerel, and it shows his accidental discovery of radiation in 1896, when a photographic plate was left in a drawer with the lump of uranium. He won the Nobel Prize for Physics in 1903 along with the Curies. He died at 55 and while I can’t find anything definitive on it, he was awfully young, like Marie Curie. I wouldn’t be surprised if in fact it was the radiation that got him. On the topic of early deaths among those researchers, I’m now reminded of a short time-travel story I read once. In reality, Pierre Curie died in an accident. In that world, he was spared, only to die a few years later from radiation-induced cancer – leading that world’s version of Marie to develop Pitchblende bombs; essentially, an early version of a ‘dirty’ bomb today. The face of warfare was drastically changed. Yet another talking beaker? Oh, the forties.